The Air Jordan Future blends one of the most iconic designs, the Air Jordan 11, with a one-piece woven upper to create an entirely new look. The sneaker pays tribute to the symbiotic relationship between basketball performance and lifestyle appeal. When the first version of the Jordan Future dropped, the market fell in love with it instantly, so we have been seeing new colors drop frequently for that reason. 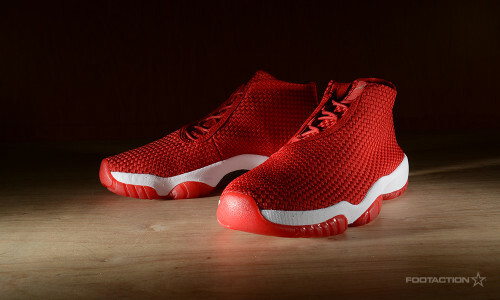 This particular version of the Jordan Future comes complete with a bright and vibrant “Gym Red” upper that is quite the eye-catcher. The deconstructed upper forgoes a heel counter and toe enforcer for a futuristic, minimalist style overall. To contrast the Gym Red, the sneaker has a White midsole that creates layers within the colorway. The shoe is completed with a translucent Red sole. Available in stores and online tomorrow. Check our Release Locator for stores. Print article This entry was posted by hhcblog on July 6, 2014 at 1:57 pm, and is filed under Footwear. Follow any responses to this post through RSS 2.0. You can leave a response or trackback from your own site.